What seasonal produce should you be eating this July? At Create, we believe in cooking with seasonal and fresh ingredients. You’ll get extra flavour, extra crunch and extra juiciness in all your dishes. Stick to nature’s bounty and you’ll get the added benefit of nutrients tailor-made for the time of year. For us, July means Cherries, one of our favourite delights of the the summer! Smooth, plump and perfectly formed, a fresh bowl of cherries never hangs around for long, and in July they are at their best. The perfect fruit for summer desserts their delectably distinctive flavour also makes them a good match with most meats. Not only that but they are bursting with vitamins and antioxidants and some people believe that they can reduce blood pressure, as well as help with conditions such as arthritis. 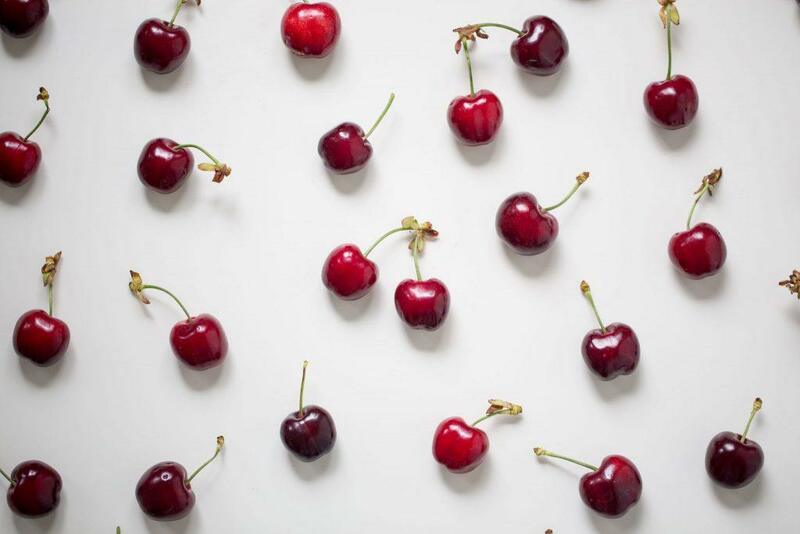 Although cherries can easily be found supermarket shelves, we always think it’s worth hunting out those round, deep red stone fruit from a local farmers market or even your own garden or allotment. Look for plump, shiny cherries that have their stalks attached and look for fruit that is dark red, firm but not hard. As a general rule dark cherries more tend to be more acidic and sharp where as pale ones are sweeter. Sweet cherries are suitable for eating, sour cherries are great in tarts, pies, crumbles and sauces. We always recommend trying one before you buy, as long as it doesn’t get you in trouble! You can store unwashed cherries in the fridge for three to four days and wash them just before serving. Cherries also freeze well should you buy a few too many. If your using a recipes with lots of cherries (like the below) we’d recommend buy a cherry stoner to save you time! Here is are two of our favourite recipes, using this delicious fruit. 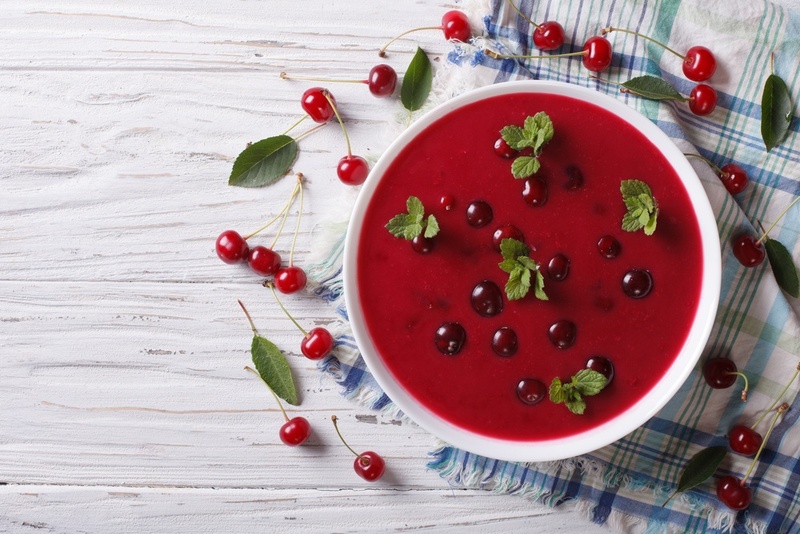 Most recipes for cold cherry soup or ‘ Meggyleves’ originate from Hungary and Poland, where cooks would use sour cherries and a lot of sugar. Traditionally the soup is made with sour cream and heavy cream but yogurt or crème fraîche can be used and will be much lighter. 1. Pit the cherries and place them in large soup pot with the water. Bring mixture to a boil then reduce to a simmer five minutes. Skim the cherries from the liquid and set aside. 2. Add the sugar, red wine, salt and lemon zest to the pot and bring back to a boil over medium-high heat. Boil the mixture for five minutes, then add the cherries back into the pot.Reduce the heat, cover the mixture and simmer five minutes. Remove from the heat and allow to cool. 3. Place the yogurt in a large bowl and slowly whisk in a cup of the liquid from the soup. Whisk until the mixture is smooth. gradually add the remainder of the soup and whisk until smooth. 4. Refrigerate until suitably chilled. Before serving, you will have to stir or whisk again, as the liquid and yogurt are likely to separate. 5. Serve in bowls or in glass tumblers and garnish with additional halved, pitted fresh cherries. This classic French dessert many look fancy but it’s simple to make and delicious! 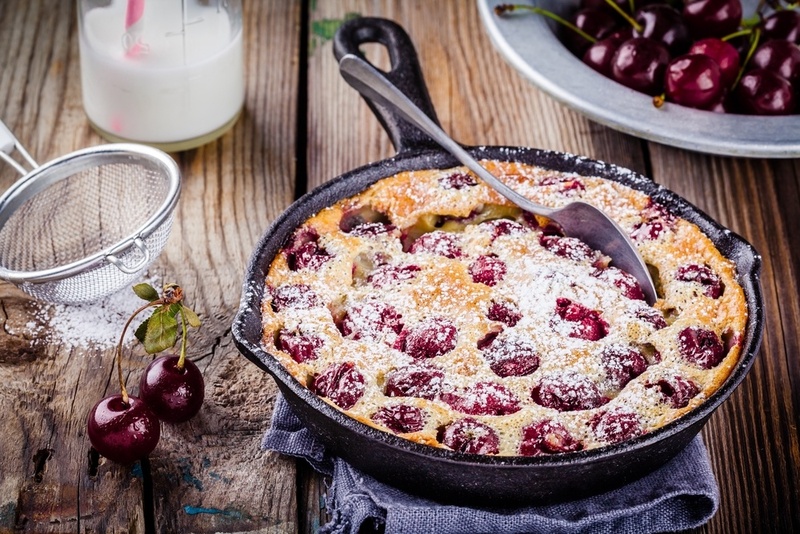 Clafoutis are baked flan-like cakes hailing from the the Limousin region of France. It makes a lovely afternoon snack/tea cake or brunch dish. Some traditionalists insist that you keep the pits in as they impart a almond flavor when baked within the custard, however, for our recipe we’ve removed the pits. 2. In a bowl, whisk the sugar and eggs together until reach a lighter in colour. 3. Gradually beat in the softened butter to the mixture. Once the butter is incorporated, add the flour and salt all at once and whisk until you have a smooth batter. 4. Now slowly pour the milk into the batter, a little at a time, followed by the almond extract (and liquor if you are using it). The batter should be very smooth and shiny. 5. Place the cherries in a buttered glass or earthenware baking dish or skillet that can go in the oven. 6. Pour the mixture over the cherries and bake 25 to 30 minutes, until slightly browned and almost completely set in the middle. 7. Leave the clafoutis to rest on a cooling rack for at least 15 minutes before serving in wedges. Has this inspired you to head to the kitchen? Show us your creations! Tweet us @Createfood, to share your pictures.